When you enter the Durbar Square in Kathmandu, you are surrounded by impressive old buildings. Each one represent a different old Nepalese architecture style, and has intricate wooden carvings and beautifully shaped windows and roofs. The old Kumari residence, is another beautiful building, with an open courtyard and it serves as the home of the current “Living Goddess” who is believed to be the bodily incarnation of the goddess Taleju (the Nepalese name for the Goddess Durga). Kumari literally means “virgin,” and it is the tradition of worshipping virgin young girls, as a manifestation of the divine female energy. A very young girl, as young as 3-4 years old, is carefully selected from the Shakya clan of the Nepalese Newari community. This caste is usually composed of silver and goldsmiths. She will live in the Kumari Royal residence and will be worshipped as a living Goddess, until she begins to menstruate. When she finally becomes a “woman,” it is believed that the goddess leaves her body, and she becomes a common being. Every city in Nepal have its own Kumari. The selection process of the new Kumari, is very specific. Eligible girls are from the “Newar Shakya” caste (the clan to which the Buddha belonged). After these basic requirements, the girls are examined to resemble the ideas of bodily perfection. Voice soft and clear as a duck’s…..? Once the priests chose a candidate, she must undergo a series of “bravery” tests to ensure that she possesses the qualities necessary to be the living vessel of the fearless Goddess Durga. The greatest test will be made during the Hindu animal sacrifice festival, when buffaloes, chickens and goats are sacrificed to the goddess Kali. The young candidate will be taken into the temple and will be required to walk among the blood in the courtyard, where the severed heads of the animals are place by candlelight, and men with large shiny knives, slice the heads of living animals. If the candidate truly possesses the qualities of the Goddess Taleju, she will show no fear during this experience. If she does, another candidate is brought in. After passing all other tests, the final test is that she must be able to pick out the personal belongings of the previous Kumari from an assortment of things placed before her. If she is able to do so, she is the chosen one. Once the Kumari is chosen, she undergo a series of tantric rituals to purify and cleanse her body and spirit of all past experiences. When all these rituals are completed, it is believed that the goddess Taleju enters her and now she is presented as the new Kumari. The new Kumari will leave her palace only on ceremonial occasions. Her family will visit her rarely, and only in a formal capacity. Her caretakers and playmates will be chosen from the Newari people of her own caste. She will almost always be dressed in red, wear her hair in a knot and have an eye painted on her forehead, which is called “fire eye” and is a symbol of all knowing powers of perception. 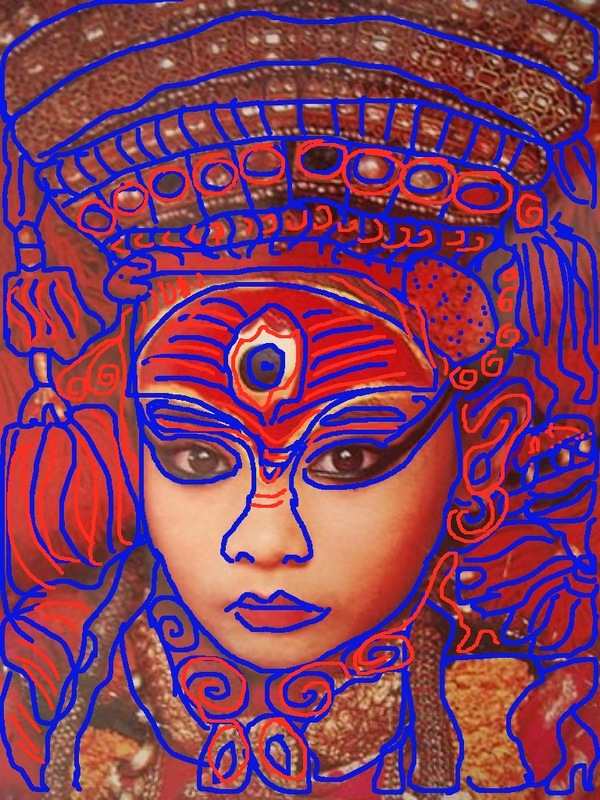 The Kumari will walk across the Durbar Square on the day of her initiation. This will be the last time her feet will touch the ground until the time of her menstruation, when the goddess departs from her body. When the Kumari ventures outside of her palace, she is carried or transported in her golden palanquin. Her feet, like all of her, are considered sacred. Devotees will touch them, hoping to receive respite from troubles and illnesses. The King himself will kiss them each year when he comes to seek her blessing. Traditionally, the Kumari girl received no kind of education as she was considered to be omniscient. However, since she will become a common mortal being upon menstruation, it is now believed that it is necessary for her to have an education. Kumaris are now allowed to attend public schools. The Kumari has many ceremonial duties. She is not treated as a child, never punished or ordered about, yet she is naturally expected to behave as befits a goddess. She is expected to be peaceful, and to show much serenity. A temperamental goddess is believed to bring bad energy to those who look up to her and worship her. Devotees believe that even a glimpse of her, will bring them good fortune. Crowds of people gathered below the Kumari’s window in the Kumari Chowk, (or courtyard,) of her palace, on the day we visited there. Jules saw her through the carved wooden screen, I have missed her. Government officials or those who are better connected, visit the Kumari in her chambers where she sits on a gilded lion throne, to seek her blessings. The end of a Kumari’s divinity happens as soon as she begins to menstruate. A new Kumari is then selected, and the former Kumari undergoes a number of rituals that “removes” her divinity. Once she is no longer a Living Goddess, she is given a gold coin and a piece of the regal red fabric, cut from the cloth she wore during her years as a Kumari. Former Kumaris receive a pension from the State of 6000 rupees per month ($80). This may sound like a tiny amount, but it is around twice the official minimum wage and around four times what an average worker earns around the country, per month. They are often continue to be called Kumari rather than by their birth names. They are allowed to get married and have children, although superstitions say that a man who marries a Kumari is doomed to die within six months by coughing up blood. Luckily these superstitions are not widely cherished, and many past Kumaris were married and gave birth. The process of worshipping the Divine in a human form, is not new. It is documented to have started 2300 years ago in India, and in Nepal as early as the sixth century BC. The association of a virgin with purity, and lack of sins and past mistakes, is believed to indicate a good cycle of incarnations, or a pure karma. This belief inevitably imply that scars, cuts, blemishes and diseases, are a result of a hard life, brought about by lower karmic consciousness. The belief in a female Goddess, is cherished out of the idea that this entire cosmos, is a creation of the Goddess and that it came out of the Goddess womb. The worship of idols, represents the recognition that the Supreme Spirit exists in everything and in all. It is believed that it exists in all living beings and in all inanimate objects equally. This means that the Supreme Spirit is in the wind, the river, the sky, the air, and in every statue, shape or sculpture that is made to represent the concept of the goddess, as well as in every living being. ← Things you would not see in any other parts of the world….